Dental implant? Where can I save the most? Dental treatment is one of the most popular medical tourism procedures, although it’s not always an easy thing to decide whether we want to have our teeth done home or at a dental clinic abroad. For those who choose to find a premium quality service in a different country, saving money is an extremely crucial point. But how can those significant savings be made? Let’s see below how average costs may vary depending on the country for a simple but very popular treatment like the dental implant surgery, which can easily be done in Budapest. 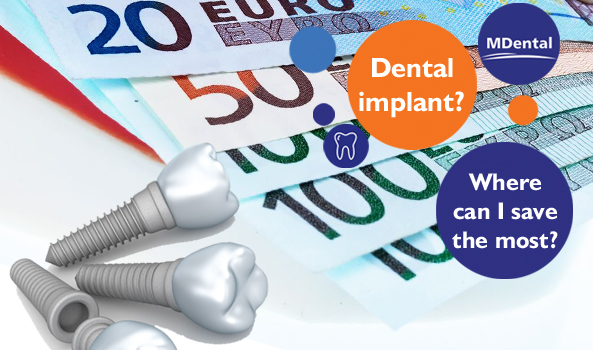 First, we need to clarify what is included in the price of a dental implant. In general, for an uncomplicated case – when e.g. bone grafting or sinus lift is not needed – it’s the dental implant itself, and the surgery costs (also including implant exposure, healing screw and check-up). As far as these costs are concerned, the comparative table below for a single dental implant gives a fairly accurate idea of the probable reasons of the patients choosing to have their dental implant done abroad, especially in Hungary. Asking for only a dental implant is not a typical case. For example, at our dental clinic in Budapest we have hardly ever experienced that someone had only come for a single dental implant without a crown. To accomplish the restoration of the whole teeth, other components are needed and further works are required. Now let’s see the prices for a complete dental implant, including the costs of the dental implant, the abutment and the the porcelain crown and of course the surgery (still without sinus lift and bone grafting). When it comes to our teeth, we aim to find the best experts at the best price. And this table above shows exactly this best price. And as for expertise, you will find some more reasons why to choose us. Now all conditions are given to mix this with a pleasant travel experience in Budapest! Our highly qualified and experienced oral surgeons and cosmetic dentists in Hungary will be glad to meet you and discuss your dental implantation in Budapest and the future of your smile. Please feel free to ask us at info@mdentalclinic.eu. Our colleagues would be really happy to help you with your request and willing to discuss the details of your future treatment. Please send us a bit more detailed description to info@mdentalclinic.eu on your current oral state and your concept of tooth replacement. If it is possible, please attach an X-ray or CT scan picture as well. We will contact you as soon as possible by e-mail and send you all the relevant information to your kind request. Im calling on behalf of my mother who wears full dentures, top and bottom. she is 65 years of age and lost all her teeth due to poor hygiene and too much sugar. I was hoping to get a cost of how much it would be for full mouth, if possible. Sorry for the late, but we will get in touch with you as soon as possible by e-mail and send you all the relevant information to your kind request.